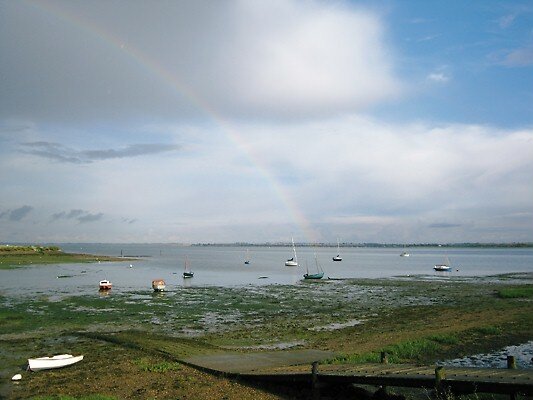 Goldhanger Sailing Club | Sailing for everyone on the Blackwater! GOLDHANGER Sailing Club, nestling between the western seawall and the aromatic strawberry fields of Wilkin & Sons Ltd, enjoys one of the most idyllic and tranquil settings on the River Blackwater. With a membership of around 100, the club’s ethos is one of friendliness and co-operation with, as it states in the rules, an objective “to encourage boat sailing and sociability among members”. Interest encompasses all types of sailing, including sailboarding and canoeing, with racing organised on Sundays during the season. Since 2000 the club has each year staged the highly popular Kestrel Open. A small number of motor boats are also allowed. There are men’s and ladies’ toilet facilities, a kitchen area and a large compound for dinghies, day-boats and trailers etc. A steel container annexe is used for storage and as a men’s changing room, and the creek is reached via a sturdy launching ramp, erected and maintained by the club. The club was formed in 1959 by a small group of village sailing enthusiasts during an informal chat in the bar of The Chequers public house, and in the summer of 2009 celebrated its 50th Anniversary. In the early days Tom Owers, a founder member, allowed the club to use a shed in his garden at the end of Fish Street for storage. Early in the 1970s the first clubhouse was erected beyond the playing field at the head of the creek. In 1991 the club moved to its present site beyond one of the strawberry fields owned by its landlord, Wilkin & Sons Ltd, having acquired free of charge a prefabricated classroom from Great Totham Primary School. Transportation, rebuilding and refurbishment was carried out by club members. On completion in the spring of that year, the new clubhouse was opened officially by John and Peter Wilkin. Weather observation for Maldon at 12:00 BST. Weather information derived from data from bbc.co.uk.